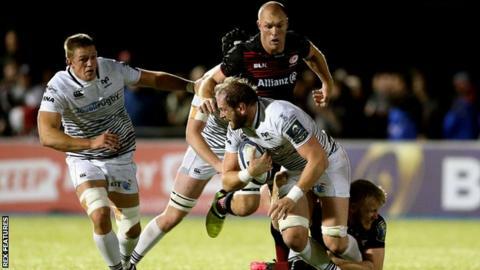 Alun Wyn Jones says Ospreys' Champions Cup defeat at title-holders Saracens was "a step in the right direction" despite a seventh straight loss. The Ospreys collected two bonus point from the 36-34 reverse, despite huge injury problems. "We deserve a bit of pride in the performance, there's not many teams come here and pick two points up," said Ospreys captain Jones. His team next face Dragons in the Pro14 on Friday, 27 October. Ospreys led 17-7 in the first half at Allianz Park and 20-17 in the second, then scored their fourth try two minutes from time to earn some reward. "We don't accept mediocrity as a group or individuals, but we acquitted ourselves not like a team on a bad run," Wales lock Jones told BBC Sport Wales. "It's a step in the right direction, I'll let you know whether it's a turning point after the next 80 minutes we play." After two rounds of Europe the Ospreys have three points in Pool 2, seven behind Saracens and six adrift of Clermont, though their next Champions Cup opponents Northampton have yet to get off the mark. "It's not easy (to qualify) if you lose your first two, it's a tough mountain to climb irrelevant of who's in the group," admitted Jones. "Northampton will be a wounded animal as well and they're not lacking in quality." The Ospreys suffered an injury nightmare against Saracens, with Justin Tipuric (thigh problem) pulling out after the warm-up, to join fellow Wales flanker Dan Lydiate (back spasm) on the sidelines. They also lost wings Jeff Hassler (head knock) and Cory Allen (leg injury) during the match, while scrum-half Tom Habberfield went off with cramp after switching to the wing. That meant debutant flanker and Olympic Sevens medallist Sam Cross was on the wing to grab the final try, while replacement prop Gareth Thomas ended at flanker. Absent Wales scrum-half Rhys Webb is under treatment for a swollen knee after a week of being at the centre of a Wales selection policy controversy, which is set to exclude him from international consideration while at Toulon next season. Centre Owen Watkin, 20, was one of the Ospreys' stand-out performers against Saracens with a try to cap a fine individual display. It was his second starting appearance after returning from a season-long knee injury and could put him in line for Wales consideration in the autumn internationals. But Ospreys coach Steve Tandy is in no hurry to rush him back into the limelight. "It's easy to talk about Wales, but the kid's played two games for us, he's come back from a horrific injury and had a bump on the head in pre-season," said Tandy. "He went back to Bridgend to get his confidence back, we made it easy for him to come back against Clermont but he grew into it as the game went on. "(Against Saracens) I thought he was a real handful, but he's still modified by his injuries and we've got to protect him going forward."